This board is an Arduino compatible AVR DIP-40 development board. It got all necessary features a development board should have! The board supports most major AVR DIP-40s, including ATmega1284, ATmega644, ATmega324, ATmega164, ATmega32, ATmega16 and ATmega8535. It got an onboard USB to serial chip as well as an ISP header and a JTAG header for serious debugging. Each board is assembled by me, and all boards are individually tested before shipping. I've been using Arduino Uno for years. It's a simple and great board but there's some features missing in order to become 'The perfect development board'. IO peripherals written on the underside of the board. No need to search in the datasheet anymore! Still, the board shows its real potential when using it together with the rock solid and feature rich MightyCore! 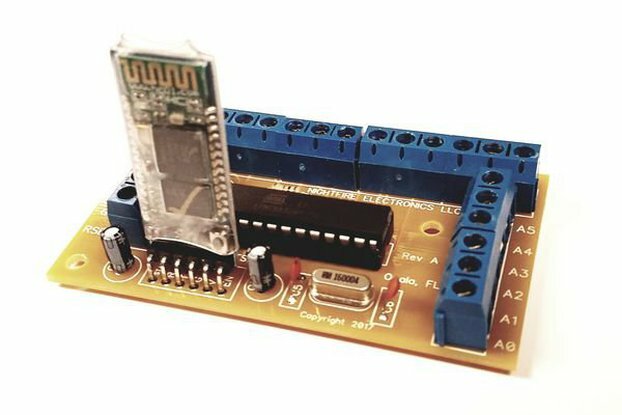 MightyCore is an Arduino add-on that let you use this board with all its features in the Arduino IDE! 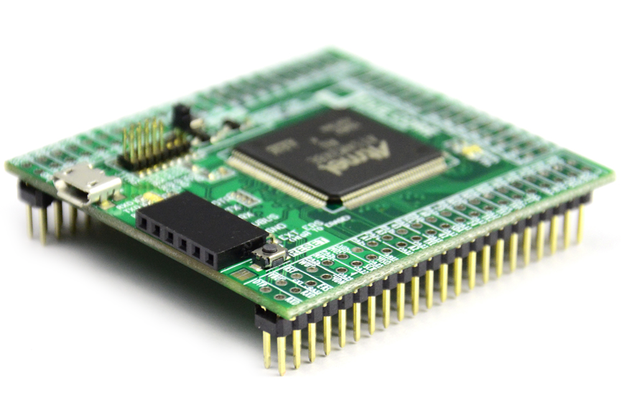 All supported microcontrollers can be programmed using the onboard USB to serial chip. MightyCore is open source and can be downloaded from GitHub. Read more about MightyCore here! Download the CH340G USB to serial driver if your OS doesn't support it. A. MCU is socketed allowing easy replacement; so (a) can be used to re-program MCU IC's and then relocate them to another target board, (b) once the MCU is corrupted it may be easily replaced, (c) different AVR ATmega DIP40 MCU may be used (in my case used ATmega1284P). B. Beyong ISP has also JTAG header connection, allowing professional debugging, subject to debugger device availability (in my case used Atmel-ICE device). F. The pins allow connectivity with both female and male jumper wires. Very convenient, accelerating development process. H. The on board diagnostic LEDs allow the developer to observe all basic signals, as PWR, diagnostic-LED, Rx and Tx. Congratulations to the board designer. Shipping was long but looks like Christmas time was really a bad period. Santa Claus was probably too busy ;-) to send something from Norway to France. What can I say about the board ? It's perfect, easy to use and well documented by its creator. Even for a dummies like I am it works perfectly. In few hours I have been able to play around with 684 and 1284P processors. And if you are facing problem, or need some additional explanation, just send an email to Hans and you will get a great and clear support. To conclude I would say that everything is close from perfection ! Thanks Hans. Welcome to Rockin' Overdrived Arduino Mighty arduino core !! I'm an ex-old-small guitar tube amps manufacturer. I use PlatformIO with the incredible Hans/MCUdude Mighty arduino core ! I re_born with some new goals ! Simply sublime, full integration, arduino with more pins with Atmega 1284P, more features and in a so easy way. It was natural to me to acquire this board, it give so many options ! Thanks Hans, you made my AVR world's exploration so cool. Almost 3 months ago I received 2 boards from Norway. The boards came in a ESD protected package and after unpacking my first impression was the really good quality of the board (PCB layout, soldering, silkscreen, etc.). After connecting the board the only thing I can say: It works like a charm! Thumbs up for this product. I tested it with Atmel Studio and with the Aruino IDE under Linux, no problems at all. What I will do in the next future: Replacing the socket with a zif socket and developing a TQFP to DIP adapter board for the ATMEGA324PB. An amazing AVR development board! This is such a great development board. Lots of careful attention was put into it. * The silkscreen is clear and readable. * Lots of GND pins for a logic analyzer probes. * Male and female headers side-by-side. * JTAG, ISP, and HVPP headers are broken out. * 5V or 3.3V selectable. Overall, it's a really nice AVR board and the shipping from Norway was fast. I bought the board and I have to compliment you for the quality. One question: to program an Atmega 644p which programmer should I select on arduino IDE? I needed a development board that would take fit an ATmega644 or similar for memory fit. The board itself is well constructed and works exactly as expected. The little perks and details that were added to enhance this unit beyond a base Arduino Uno style board make it well worth the investment. Seller is very easy to work with, would purchase again. Fantastic product, easy plug & play! This development board really is fantastic. The layout is very clean and extremely well labeled, It is easy to understand what all the pins do without having to consult documentation. I really like that both male and female headers are available for every I/O, power, and GND pin, as this makes it much easier to connect things with a random assortment of jumper wires. When I first got it I immediately swapped in a 1284p, and it ran without a problem. Arduino IDE under Ubuntu 18.04 with MightyCore sees and programs the board without any extra hassle. I only rated 4 stars on the shipping because it is untracked, and I like to see where my item is. Thank you for your review! I'm glad you like the board and that you find it useful. About the shipping, I agree that tracking is much better for everyone. It's nice too see where your package is at all times, and it's saver compared to "regular" mail. The reason why I don't provide shipping with tracking is simply because it's ridiculously expensive. Personally I don't think $30+ for shipping is fair when the board only cost $35? However I could add it as a shipping option for people who's willing to pay for it. I was in need for a arduino compatible MCU for a project, and the MightyCore was the perfect solution. 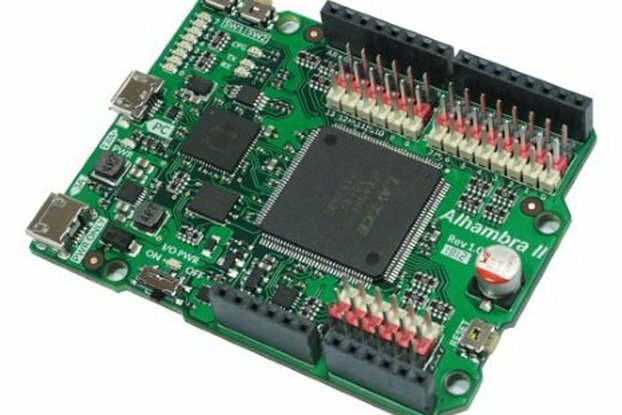 With the MCU between the Atmega 328 and 2650 it fits perfect for the application. With the very well documented hardwareplattform for the Arduino IDE it was piece of cake to programm the 1284p in my project. The MightyCore PCB serves as a prototype for testing the software, and it worked like a charm for me. Documents for non experts would make it even more valuable! first of all the board is really that one what I was looking for since long. 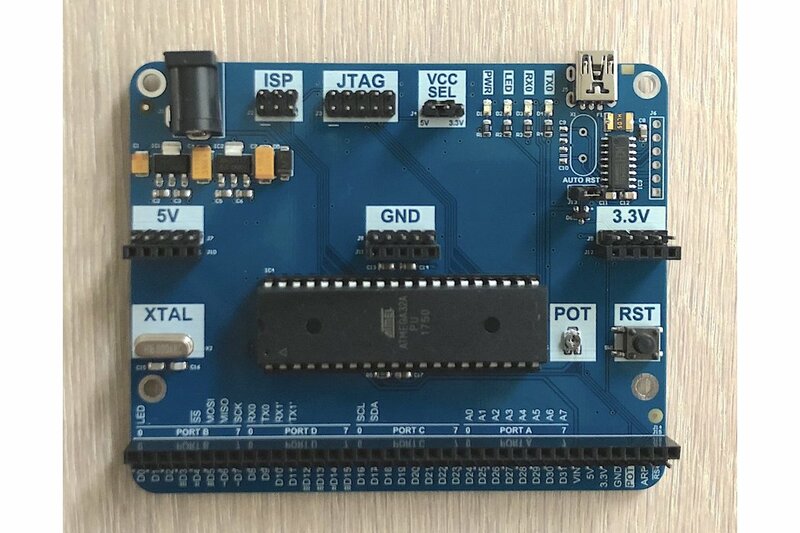 As I am still not so familar with MCUs I really missed some documentation and/or example for test, especially I would appreciate to know how to use the HVPP connector (I know what it is for). For sure, there are a lot of test routines available which could be adapted from Arduino environment - and there are also a lot of information to be downloaded from your Web site. Having this board now for some weeks I still feel that I have not enough practice to get almost the maximum from it even I come closer to it day by day. Therefore, I will keep the board for later times and I am sure I will got it. As the board is without a spot, I am still the mind that it was a good idea to buy this! Best regard to all of you! This board is great and useful, like I wrote another member : exactly what I'm looking for ! Bring together in a same side all I/O ports it's very usefull. Description fonction pin (and other information) on both side of board allow to don t waste time and missed error during wiring. The size of board is ideal too, not to big, not to small. Mignty core is great and useful add on too, and this core support many programmers tools. Finallly, thank to MCUdude, for great communication and services. It speaks for itself! Great design and building. Planned to manage a little greenhouse. My goal to develop in assembly language. As it is mentioned by the seller, its a more flexible devboard than the Arduino competitor. I love the DIP shaping. This is a great development board! I've only had it for a day, and already love so many of it's features. The male and female headers on all the IO and power is great. Being able to quickly change the crystal is so nice. The simple fact that the board will work with a number of different processors will make it my go to board for quite a few projects for sure. 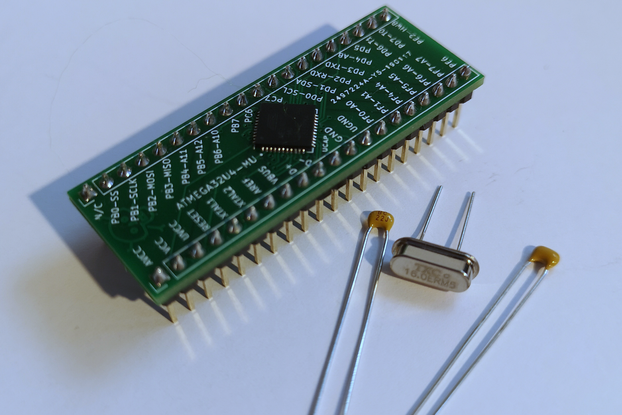 As using different sensors with different libraries on a UNO always results in low memory and a MEGA2560 is not available in a maker friendly PU pack I decided to go for an ATMEGA1284p-PU (40 Pin). This chip does have even more memory then the 2560 but less IO pins. As most sensor are running on a bus (SPI/I2C/Onewire) and multiple sensors can be connected on the same pins memory is more valuable than pins! This board fullfills all my needs - and more! Just one thing which is missing in the describtion (I think): There is a little LED besides the power LED which is connected to PB0 (D0). Quite usefull for blink or status indication in your sketches. I already bought 2 of the board! Shipping was pretty quick and The board works great! This board is going to be the heart of my Raman spectrometer project over at Hackaday, http://hackaday.io/project/18126-3d-printable-raman-spectrometer, it will be running the TCD1304ap CCD chip, which will be the detector. I'm really impressed with the boards expandability for future project developments. Excellent product that has helped save me quite a bit of time getting some interoperability between my cache of 1284-PUs and my arduinos. I only wish that the DIP40 socket was left unattached or that a ZIF socket was used in its place (I may go back and make this very change, and will let you know what comes of it, if it was a worthwhile modification). I'm an undergraduate electrical engineering student using this solution to bridge a gap between the ATMega 1284s that I find are standard in projects here and the versatility of the Arduino library. Thank you for the feedback! If you desolder the connector for the potentiometer, you'll be able to fit in a ZIF-socket in there. If you use a little force I think you may be able to fit the ZIF-socket into the socket that's already soldered to the board. I am happy with this product, and its technique support.Had a question the vendor was very prompt in helping and answering.